In my review of Captain America: The Winter Soldier, I made a point of mentioning I was a fan of the X-Men series, and it should also be noted that I’ve enjoyed the X-Men film franchise since its fresh-faced beginnings in 2000. It’s a series that seems to be improving with age, recovering from severe stumbles like X-Men: The Last Stand (2006) to finally hit its stride only, what – six, seven films in? Except for the excellent X-Men: First Class (2011), I think the strongest of the franchise were the original two films, both directed by Bryan Singer. Singer returns to the helm for the latest installment, X-Men: Days of Future Past, and I think with all this bearing in mind, it’s safe to say that on entirely its own merits, X-Men: DoFP is a fine superhero action film, and in the context of its own series, it’s nothing short of brilliant. Non-devotees, bear with me: Days of Future Past begins in an apocalyptic 2023, in which adaptable, human-engineered hunter-killer machines called Sentinels have all but wiped out the mutant race. Professor Charles Xavier (Patrick Stewart) and Erik Lensherr, a.k.a. Magneto (Ian McKellen), now an aging power couple, lead a tiny band of resistance fighters to try and stave off extinction. Their only chance is to use the powers of Kitty Pryde (Ellen Page) to send the consciousness of one of their own back in time to inhabit their younger body, so that they might prevent Mystique (Jennifer Lawrence) from committing an assassination in the 1970s which will trigger the sequence of events leading to their terrible present. Wolverine (Hugh Jackman) offers to take the trip, as his mutant healing factor will allow him to survive the excessive psychic strain of making this journey to the past. 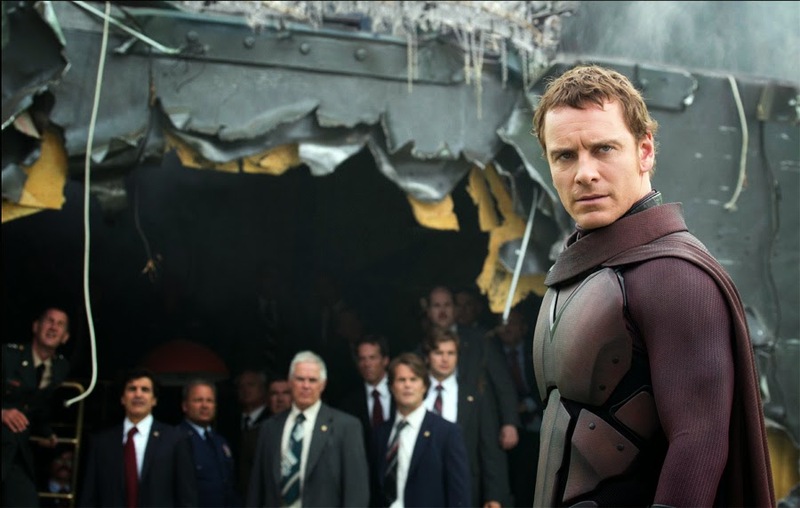 His job will be to convince the younger, disillusioned Xavier (James McAvoy) to cooperate with the radical, incarcerated Magneto (Michael Fassbender) and prevent the Sentinels from ever being created. Still with me? It’s a premise with a good deal of low-rent precedent, it’s true, but it makes for an X-Men film with huge visual variety, profound emotional resonance, and a good deal of old-fashioned excitement. While it’s heavy on plot, the script allows DoFP to jet along at a tireless pace, moving with the mutants as they try to circumvent a future which seems all but inevitable, and giving time to develop the characters along the way. Hugh Jackman as Wolverine continues to earn his marquee value through sheer ferocity of effort alone, but as with X-Men: First Class, it’s James McAvoy and Michael Fassbender who are the real show-stealers here. The conflict of interest between the altruistic, hopeful Xavier and the jaded, ruthlessly pragmatic Lensherr has been central to the X-Men canon since the very first issues of the original comics, and I don’t think I’ve ever seen it more eloquently expressed than through the performances of these talented actors. McAvoy, in his nuanced portrayal of a young, broken, fallible Charles Xavier, more than stands his ground playing off the great Patrick Stewart – in fact, in the one scene they share together, he pointedly outshines the classically-trained thespian. Both Stewart and Ian McKellen, unfortunately, are underused and underwhelming here. Their scenes are short, their dialogue sparse, and their effect verges on unintentionally comical – they’re visibly shrunken with age, and their lethargy is palpable. Still, all the fanservice in the world can’t erase the image of an emotionally shattered Professor X injecting himself with a serum designed to nullify his powers. The most stalwart character in the series is reduced to a strange anti-junkie who denies, rather than embraces, the voices in his head. Both Singer and the entire cast demonstrate bravery in their willingness to upset the series’ status quo, and in taking these risks they deliver unexpectedly captivating character moments. There’s plenty of action and though it’s frequent it’s rarely excessive. Singer is careful to let the story drive the action, resulting in very few boring or unnecessary sequences, and he employs a clever blend of CGI and practical effects to create a realistic comic book world, in which it’s easy to believe that real people (human and mutant alike) live and breathe and die. The costume and set design stick out as strong points; gone is the flourescent-lit, brushed-steel aesthetic of the previous films, replaced here with a smoggy sci-fi 1970s. 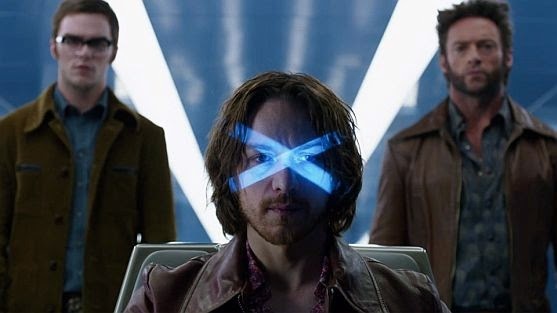 I’ve rarely seen a “period” 70s film as wholly convincing as DoFP; it’s all too easy to throw a lava lamp and some bell-bottoms in the frame and call it the seventies, but DoFP delivers a level of detail that is excruciatingly exact, down to the snap-hiss of diagetic analog TV audio and 70s society’s frankly painful obsession with avocado green. Many scenes hinge on visual moments that stick in the mind: there’s a stunning action scene in 2023 in which a mutant named Blink uses her portal-summoning power to divert attacks, enhance the abilities of allies, and control the battlefield. More instances of creative mutant powers used to great visual effect include a scene in which the camera follows a bullet Magneto is curving to chase a target as they fall through a window, and – perhaps the most enjoyable sequence in the film, soliciting raucous laughter from our audience – a scene in which a super-fast teenage mutant named Quicksilver incapacitates a squad of guards in the blink of an eye, although we are allowed to see it from his perspective, as he strolls around the room, pausing to stick a finger in some splashing soup and leisurely flick bullets off their paths. This is a film which in some ways harkens to what might be called the “Amblin Age” of the 1980s, in which blockbuster summer features still had a sense of wonder, and could run the emotional gamut from dark and disturbing to lighthearted and fun. Would that I could have seen this film as a child. There’s a strong vein of cleverness running beneath the surface of DoFP, as well, both conceptually and in execution. I find it very interesting that Mystique is the focal point for the story, for example; her function as a girl torn between Xavier and Magneto represents the larger conflict of ideology between the two. She is drawn to the comfort, kindness, and familiarity of Xavier and the “home” that he represents, but she is equally compelled by the seductive danger and sense of grander purpose that Magneto provides. There’s a lot of gray area to work with, which gives emotional credibility to her character and continues to be a strong point for the series overall. The X-Men storylines have always presented challenging thematic material like racism, class divide, segregation, and the use (and misuse) of power, becoming much like Star Trek in their exploration of moral dilemmas in a science fiction setting – in fact, Star Trek: The Original Series is even referenced in DoFP, apparently a favourite of the shy, intelligent Hank McCoy. X-Men, and DoFP in particular, allows philosophy and moral quandary to inform its structure so much more than any other action series takes the time or effort to do, and for this I think they deserve all the praise that can be heaped upon them. Why watch Transformers when the movie in the next theatre offers the same flashbang action with an added dose of literary intelligence? DoFP is not a perfect movie, although its twisty time-travel plot isn’t too hard to follow. It leaves many questions hanging unnecessarily open: after the events of this film, has the X-Men timeline been completely reset, or are there now multiple timelines? If we’re to understand that the canon established by the previous films has been invalidated, where does that leave our characters – notably Wolverine (in this future, has he been experimented on? Does he still have an unbreakable adamantium skeleton?). How exactly is Kitty Pryde, whose power is to phase through solid matter, able to send people’s consciousnesses back in time to inhabit their younger bodies? There are some uncertain motives floating among the supporting characters, too – Bolivar Trask, though ably played by Peter Dinklage, shows a confusing amount of empathy for someone who wishes to wipe out the mutant race by creating the Sentinels. But these complaints are nitpicks, and do little to undermine the effect of the film overall. With cynical cash grabs like Hercules, The Expendables 3, and Teenage Mutant Ninja Turtles looming on the horizon, and the bitter memory of The Amazing Spider-Man 2 fading in the rearview mirror, it’s hard not to feel grateful for a film like X-Men: Days of Future Past. Here is a blockbuster with a crackling brain, a shlock epic with a genuine beating heart. It treats both its source material and its audience with respect; to take the heightened melodrama of the comic book form and translate it respectfully and engrossingly onto the silver screen. The combined efforts of a talented cast and a dedicated production team have made possibly the best X-Men movie yet – certainly one of the better comic book outings of the past decade, at any rate – and I can’t wait to see what they come up with next. – Justin Cummings is a writer, blogger, playwright, and graduate of Queen's University's English Language & Literature program. He has been an avid gamer and industry commentator since he first fed a coin into a Donkey Kong machine. He is currently working as a Development Tester at Ubisoft Toronto.